The Dutch scientist Serge P. Hoogendoorn is the principal investigator of Allegro-project. He has a full time employment with the Delft University of Technology and is the principal investigator Mobility for the Amsterdam Institute of Advanced Metropolitan Solutions. Hoogendoorn is also a staff member of the Expert Centre for Traffic Management and of the Network Management foundation. The scientific work of Hoogendoorn evolves around traffic flow operations, modelling and simulation, and the management and control of these flows. Traffic flow theory is a largely based on inductive methods in which data collection and analyses form a crucial part. Since 2002, Hoogendoorn has been working on ground-breaking approaches in data collection for pedestrian and vehicular traffic flow, including unique walking experiments providing new insights into pedestrian flow characteristics, airborne video-based driver behaviour data collection, and data collection on travel behaviour under normal and exceptional conditions using an interactive virtual lab (serious gaming). All these data collection efforts have lead to important contributions in walking and driving behaviour theory (e.g. self-organization theory in pedestrian and vehicular traffic, heterogeneity in driving behaviour, etc. ), as well as new modelling paradigms, mathematical frameworks and simulation techniques to de-scribe, predict and analyse traffic dynamics. Recent work deals with traffic dynamics on larger spatial scales, which can be surprisingly well described with relatively simple relations relating exit rates to the number of traffic participants in the network and their spatial distribution. His work on control focuses on application of traffic flow theory to increase the utilization of available infrastructure. This research has provided new theory for the real-time cooperative control of vehicle platoons, shockwave removal using dynamic speed limits (coined Specialist), coordinated and network-wide traffic management, robust evacuation management, and crowd management. Some of these theories have lead to large-scale applications in the field, other have lead to new theoretical in-sights and robust optimisation approaches. Hoogendoorn’s scientific reputation is evidenced by a considerable number of memberships of diverse academic and non-academic committees. He is a member of the highly esteemed International Advisory Committee of the ISTTT, and of several committees of the US National Academies Transportation Research Board (one of which he is leading). He is (one of the) editor(s) of the EURO Journal on Transportation and Logistics, of the European Journal of Transportation and Infrastructure Research; he has acted as (associate) editor of Transportation Research A and B, and the Journal of ITS (all are top journals in the Transportation domain). Hoogendoorn has acted as a member of numerous PhD committees (ICL, EPFL, Melbourne University, Napier University, KU Leuven, TU Twente, TU Eindhoven, VU Amsterdam, University Utrecht), and selection committees. He has acted as a panel member for the VENI and the VICI grants, and for the ERC starting grants (2013, 2014). Off course, he acts as a reviewer for all main journals in the Transportation domain, but also for Physics and Applied Math journals. Hoogendoorn has chaired multiple international top conferences, including the prestigious International Symposium on Traffic and Transportation Theory 2013, Pedestrian and Evacuation Dynamics 2014, International Conference on Emergency Modeling and management 2010, and Traffic and Granular Flow 2003 and 2015. He is cofounder of the hEART association, and will organise its annual conference in 2016. Hoogendoorn was a founding member of the NEARCTIS Network of Excellence, in which the top European researchers in the field of Intelligent Transport Systems have been working together over the past five years (e.g. Prof. Ben Beydecker, Prof. Michael Bell, and Prof. Markos Papageorgiou). With 200 peer reviewed journal publications and an h-index of 20, the applicant is one of the most productive and highly cited researchers in his research domain. 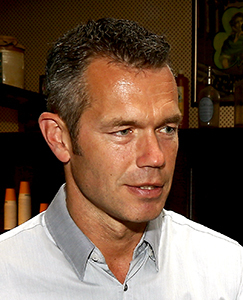 Hoogendoorn has edited or (co-) authored 9 scientific books. Hoogendoorn has received various best paper awards at national and international conferences.